"The movie that goes straight for the jugular." 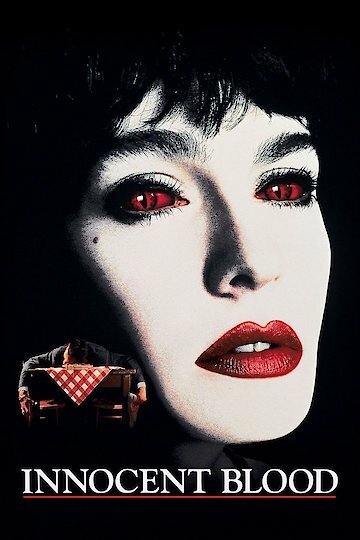 Innocent Blood is a horror crime film that stars Anna Parillaud. This movie is rated R for violence, gore, and sexual content. This film has a running time of almost two hours. When a vampire named Marie finds herself hungry in Pittsburgh she uses her looks to get a mobsters attention. Offering her a ride he gets more than he bargained for when she feeds on kills him. As a modern vampire Marie has a set of moral that will only allow her to feed on the criminals of society. Assigned to the gruesome death of the mobster undercover cop Joseph Gennaro, played by Anthony LaPaglia, stumbles on Marie and learns of her vampire nature. He begins to track her in hopes of catching Marie. Still hungry Marie turns to the mob boss Salvatore, played by Robert Loggia, for her next meal. While feeding on him she is interrupted. Thinking that she has killed him Marie leaves the scene. Unfortunately, Salvatore isn't quit dead and soon finds himself turned into a vampire. When Salvatore returns home he begins feeding on raw meat and sleeping in a meat freezer. Worried his wife contacts some of the boys to check on Sal. They find his behavior strange and suggest that he see a doctor. He agrees and learns that he has no pulse but feels better than he has in ages. Salvatore then begins to feed on his gang members and turn them all into vampires. Needing to fix the mess that she made Marie makes herself known to detective Gennaro. Together they work to stop Salvatore and his group of mobster vampires. Although in the beginning Gennaro is a little afraid of Marie but a mutual attraction starts and they enter into a romantic relationship. In the end, Marie and Joseph have each other and Salvatore is gone. Innocent Blood is currently available to watch free on Vudu Free and stream, download, buy on demand at Amazon, Vudu, Google Play, FandangoNow, iTunes, YouTube VOD online.